Recently my friend asked me to make a baby quilt for her cousin's baby. They love cars so this is what I came up with. It was thoroughly enjoyable to make and I love the way the colours turned out. 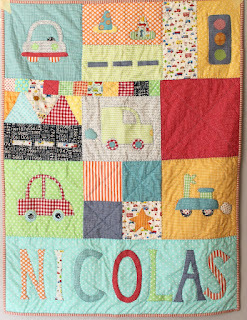 The designs are machine appliqued with a contrasting thread, I love that effect and then I hand quilted it. The pattern is my own.